Studio Line: Warner Bros. - Boys will be boys. Decades earlier, NASA passed them over for the first manned space shots. Now a hotdog team of 1950's test pilots finds that their grasp of outdated technology makes them the only ones able to repair a deorbiting satellite that imperils Earth. Let's light this candle, Cowboys! Academy Awards: Best Sound Effects Editing. 2001. Box Office: Budget: $65 million. Opening Weekend: $18.093 million (2805 screens). Gross: $90.454 million. DVD: Widescreen 2.35:1/16x9; audio English Dolby Digital 5.1, French Dolby Digital 5.1; subtitles English, French; closed-captioned; single sided - dual layered; 36 chapters; Rated PG-13; 130 min. ; $26.98; street date 4/17/01. Supplements: Four Behind the Scenes Documentaries; Theatrical Trailer; Cast/Director Career Highlights; DVD-ROM Materials. If nothing else, I have to give credit to the producers of Space Cowboys for one thing: they managed to resist the urge to feature Steve Miller’s song “The Joker” within the film. Happily, Homer Simpson’s fave tune - "Some people call me a space cowboy/Some people call me the gangster of love" - makes no appearance. However, since the movie does include a tune called “Space Cowboy (Yippie-Yi-Yay)” - from *NSYNC of all people - so any points earned by the omission of the Miller tune are totally ceded. Perhaps the *NSYNC ditty appeared in the hope that their attachment might draw a younger crowd to the multiplex. After all, the four stars of SC - Clint Eastwood, Tommy Lee Jones, Donald Sutherland and James Garner - boasted an average age of more than 65 years of age when the movie premiered in August 2000; that varied from elder statesman Garner (72) to spring chicken Jones (53). This knowledge makes Jones’ casting seem like a poor choice; not only is his age an outlier among the others - who ranged from 66 to 72 - but it means that he would have been only 11 when he was supposed to be flying jets in the movie’s opening shots; those take place back in 1958. I don’t mind that stretch, however; we easily accept actors who play much younger characters, so it’s no big deal to imagine a performer as a decade or so older than he is in reality. However, that’s not the only problem I found in Space Cowboys. Though the film presented some entertaining bits and generally was watchable, it seemed very derivative and lacked much spark or inventiveness. In 1958, a crew of military pilots - Frank Corvin (Eastwood), William “Hawk” Hawkins (Jones), Jerry O’Neill (Sutherland), and “Tank” Sullivan (Garner) - are denied their desired chance to fly in space by back-biting bigwig Bob Gerson (James Cromwell). Instead, a chimp takes flight and they apparently scatter to the wind. More than four decades later, a Russian satellite that mysteriously utilizes Frank’s design for SkyLab has begun to lose it orbit. For reasons we don’t learn until late in the film, the NASA honchos aren’t willing to let it simply flop into the atmosphere, so astronauts need to intercept it and fix it. Unfortunately, their newest crop of go-getters can’t make heads or tails of Frank’s ancient design. As such, he’s called back into duty - by Gerson, natch - to make things right. Frank’s none too fond of his old boss, of course, so when he agrees, it’s with one condition: he and the rest of “Team Daedelus” have to be the ones who go into space. Ultimately, Gerson agrees, and the wheels are set into motion. Frank settles an old feud with Hawk and rounds up the others for their brief training. Inevitably, they encounter much resistance along the way before they prove themselves on the mission itself. Basically, Space Cowboys offers the same old thing in brand new drag. The story is nothing more than a creakier rehash of Armageddon with a little bit of The Right Stuff thrown in for good measure, and a lot of it didn’t make much sense. Many plot points are resolved too quickly, such as the long-time animosity between Frank and Hawk; they buddy up very rapidly, and I have a hard time believing that wounds heal that fast. Of course, Armageddon had just a few teensy logic flaws as well, so I won’t come down too hard on SC for those elements. However, the derivative nature of the story really did turn me off to a large degree. The whole thing is just so darned similar to Armageddon in so many ways. I’d prefer not to go into too many details so I don’t provide spoilers, but the two follow very similar paths. The main difference comes from the age of the actors, as SC creates a story for the geriatric set. That’s really the only thing that differentiates the movie from the others; the advanced seniority of the performers makes them natural underdogs. Unfortunately, that creates a tale that is even more predictable than usual. If anyone thinks the old dogs won’t teach the young pups a lesson or two, then you don’t get out much. It’s absolutely inevitable that our protagonists will overcome a variety of obstacles and prove that old folks can still kick some booty. SC boasts a strong cast, but none really gets much of an opportunity to shine. Eastwood plays his usual squinty-eyed tough guy, and he’s always fun even in the face of a tired story like this. Likewise his compatriots, and I will acknowledge that it was nice to see a strong group of veteran actors together in one place. I’m always happy to see stellar character performer Cromwell; he plays both nasty and nice with equal aplomb, and he’s often the best part of the movies in which he appears. In the end, Space Cowboys offers a generally watchable and moderately entertaining experience. Unfortunately, that becomes disappointing when you examine the talent involved with the project. By no stretch of the imagination was it a bad film, but it did seem pretty lackluster and ordinary. I didn’t mind the time I spent with the movie, but I didn’t get much of a charge from it either. 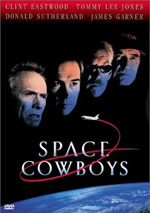 Space Cowboys appears in an aspect ratio of approximately 2.35:1 on this single-sided, double-layered DVD; the image has been enhanced for 16X9 televisions. Though not perfect, the picture of SC consistently looked very good, just as one might expect for such a recent film. Sharpness seemed strong for the most part. During a few interior shots, I found the image to present some mild softness, but these concerns were minor. As a whole, the picture appeared crisp and well-defined. Unfortunately, I did discern occasional examples of moiré effects; those problems cropped up in objects like blinds, computer keyboards, and striped shirts. Print flaws appeared virtually non-existent. I witnessed no concerns related to specks, grit, hairs, scratches, blotches, grain or other defects in this nicely clean and fresh film. Colors could seem slightly over-saturated at times, but those occasions were rare. For the most part, the hues looked quite bright and tidy, especially in relation to all of the appropriately patriotic reds and blues we witness; these came across as bold and accurate. Black levels seemed deep and rich, and shadow detail was appropriately opaque but not excessively thick. Ultimately, Space Cowboys presented a very attractive visual experience. Also largely solid was the film’s Dolby Digital 5.1 soundtrack. The soundfield often remained oriented toward the forward spectrum, where it displayed good breadth and openness. Sounds seemed appropriately placed across the front, and they moved cleanly between channels. The surrounds contributed general reinforcement for much of the movie, but they definitely came to life during various flight scenes. Whether we heard jets early in the film or spacecraft during the final sections, these segments provided very engaging and active use of all five channels; audio nicely surrounded me and created a lively atmosphere. Sound quality had a few minor concerns but it generally seemed positive. Music was a little subdued but the score and the various songs featured appeared fairly bright and clear, with decent low end as well. Effects displayed modest distortion during louder sequences - mainly when we heard engines fire - but otherwise those elements sounded realistic and clean, and they boasted some extremely deep bass; I don’t know if the shuttle lift-off matches the bone-rattling depth of a similar scene in Apollo 13, but it worked well nonetheless. Some dialogue appeared a little edgy, but most lines came across as natural and distinct, and I had no problems related to intelligibility. Actually, speech showed one concern that wasn’t related to quality. During the scenes that take place in 1958, younger actors fill in for Eastwood, Sutherland, Garner, Jones and Cromwell. Although we see different performers, we hear the aged versions; all of the dialogue was dubbed in these scenes to make the voices match the older characters. It doesn’t work. For one, the looping doesn’t fit the mouth movements very well; it always seemed obvious that the speech wasn’t natural, and this was some weak ADR work. Also, these young actors simply sound old, and since it’s so apparent that a trick is being used, it makes it hard to concentrate on the action; the gimmick involved took me out of the scene. In any case, this bad creative choice didn’t affect my grade of “B+”, but I thought I’d mention it. Space Cowboys offered a generally good - and occasionally great - auditory experience despite this awkward situation. The DVD release of Space Cowboys isn’t packed with extras, but it features a smattering of features. Mostly we get a variety of featurettes. First we find Up Close With the Editor. This interview with editor Joel Cox runs for seven minutes and it offers a short but solid look at the making of the film. Cox provides some basic production notes and also gives us a glimpse at his theories about editing; it’s too brief but it’s good stuff. Next up is Tonight With Leno. This 11-minute and 35-second piece mainly includes the unedited appearance by the Cowboys on the Tonight Show; we see snippets of this fake guest shot during the movie, but here we can watch the whole thing. This fun extra also features a few comments from Leno about how he became involved with the movie. The Effects takes a seven minute and five second look at the movies special effects. We see film clips and raw footage and hear from Visual Effects Supervisor Michael Owens and Global Effects guy Chris Gilman as they discuss their work. Again, it’s too short to be substantial, but it still offered an interesting glimpse at the film, especially when Gilman talks about the kinds of props needed. Lastly, the final featurette is the most substantial. Running 28 minutes and 10 seconds, Back at the Ranch: A Look Behind the Scenes provides a general view of the making of SC. It mixes film clips, shots from the set, and a slew of interviews. In addition to comments from the four principal actors, we hear from folks like production designer Henry Bumstead, screenwriters Ken Kaufman and Howard Klausner, and cinematographer Jack Green. All of them offer nice remarks about the creation of the film, but easily the program’s best parts came from a variety of NASA personnel. They comment upon the realism of the movie and what would happen in a similar situation. Ultimately, it’s a well-done little piece that added some solid information. Rounding out the DVD are the movie’s theatrical trailer and a Cast and Crew section. That area provides filmographies for 10 actors. Some crew members are listed but no additional information about them can be accessed; however, since Eastwood also directed SC, I guess that means at least one technical person made the cut! We also get a few DVD-ROM features on Space Cowboys. Actually, most of them are simply links to on-line sites. Two of these go straight to the official website, while the other heads to the usual “On-line Events” page. The former may be awaiting some announced features; we’re supposed to be able to perform a “Space Shuttle Challenge” there, but I found no evidence of one - perhaps it’ll start when the DVD officially hits shelves on April 17, 2001 (I’m writing this on March 19). As for the “On-line Events”, that site appears on many other Warner Bros. DVDs, and it still hasn’t been updated since spring 2000! The DVD also includes connections to the WB Studio Store, WB Home Video, WB Online, and Entertaindom.com plus “DVD Samplers” of a few titles. We find trailers and DVD listings for Contact, Mars Attacks!, Forbidden Planet and The Right Stuff in addition to SC. I don’t think the DVD-ROM area offers the “payload of enhanced features” touted by the case, but it’s not a total bust. Nor is Space Cowboys a flop as a movie. As a whole, I found it to offer a decently entertaining experience, but I couldn’t help but think it was a disappointment. There’s an awful lot of talent involved in this flick for it to be so uninspired and derivative. The DVD provides very good picture and sound plus a modest complement of extras. In the end, Space Cowboys is worth a look for fans of the performers but it doesn’t offer as much general appeal as one might expect.